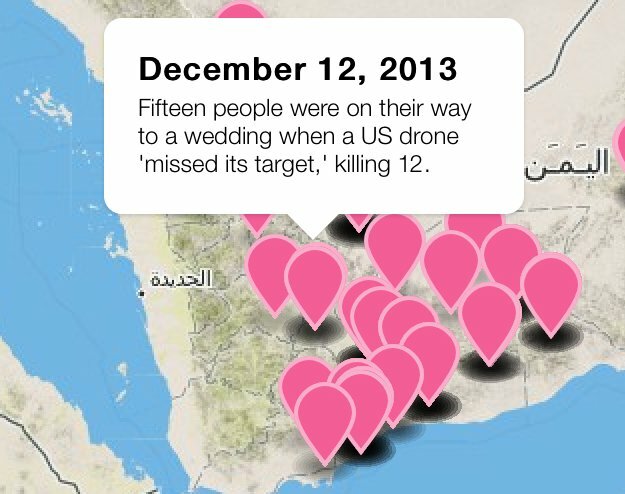 The Metadata+ app which tracks U.S. military drone strikes by was created by Josh Begley, research editor for The Intercept. Begley changed its name from Drones+ after it was rejected as "objectionable" by Apple five times. At the time, an Apple employee told Begley that the app would never be approved if it focused on US drone strikes, but would have a chance if he "broadened his topic" because "there are certain concepts that we decide not to move forward with, and this is one." Metadata+ never the word "drone" -- this may be how it snuck past the Apple censorship board. But seven months later, Apple has unceremoniously yanked it. Apple: a giant corporation that gets to decide which journalism you're allowed to access with apps on your device, and whose lawyers repeatedly told the US government that changing this situation should be a felony punishable by five years in prison and a $500,000 fine. Ecosystems work great -- they just fail miserably. The important part of a benevolent dictatorship isn't the "benevolent" -- it's the "dictatorship." Begley struggled to get the App Store to accept his work—Mashable reports that Metadata+ was approved this February after five rejections. The sensitive topic of U.S. drone strikes seems to have been a problem for Apple: Begley was rejected last August because his app might be "objectionable" for many audiences. In order to get past Apple's restrictions on the kind of content it allows in the App Store, Begley changed the name of the app (it was originally called Drones+) and scrubbed all mention of drones from within the app. Begley told Mashable that an Apple Review Team employee contacted him after several rejections and told him that if the app focused specifically on U.S. drone strikes, "it's not going to be approved."